A great Tetris clone for FREE ! In a scary future, thousands of bionic soldiers continuously kill each other. Acquire utility rapidly and without troubles. SoftEmpire catalog is cheerful to show a huge set of the best freeware, utilities, and software systems. On this directory you may download demo editions of favorite commercial software, and get the greatest freeware for your laptop or cell appliance,gadget. Search an ultimate library of first class recent utilities on SoftEmpire! Test demo editions and obtain advanced apps on your PC or digital appliance. See the latest editions and updates of typical app, recent software solutions, and notebook programs! Obtain now! Playing this game is easy as a pie but victory implies here a much more strenuous and challenging undertaking. Simply use the mouse and choose two adjoining balls you want to swap, so that you'll get a one-color line. A subsequent explosion will mean that you've just scored your first points. The smaller the board, the more precious your points are. If you are deadlocked and no moves are left, then the game is lost. Along with an engaging gameplay, you will discover nice graphics and a lighting effect that gives the balls a cute 3D look, adding elegance to the whole game. What's more, you can adjust the light sensitivity to your comfortable level. Apart from playing, you can listen to the gentle voice of the built-in midi player which is another novelty. Vividly textured balls are one more reason to buy this brilliant puzzle. 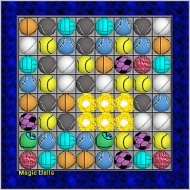 Try Magic Balls and become a puzzle expert! A fine jigsaw puzzle game for Pc. It runs in fullscreen, with 65,000+ colors, high resolution and it have a huge collection of beautiful jigsaws ( over 450! ) made from awensome photography. All the well known features included. Try it now!